When I hear people talk about how gross/bland/weird tofu is or how it’s something that only vegetarians and vegans should eat, I think it’s a real pity that they haven’t had a good experience with it. Yes, it is bland if you just have it by itself with absolutely no seasoning whatsoever but for those who have had it done well, you will know that tofu can taste fantastic. In terms of mushrooms, champignon/button mushrooms have never been my vege of choice, although I eat them happily enough. I much prefer the textures and tastes of shitake, enokitake, straw and oyster mushrooms; I think this comes down a lot to the fact that I grew up eating predominantly Chinese food and I take a particular fancy towards Asian foods. My mum’s tofu and oyster mushroom stir fry puts together two ingredients that some people may find foreign but once you try it, you’ll see there is nothing gross, or bland, or weird about it. Ingredients consist of the Holy Trinity (sliced ginger, sliced garlic and diced spring onion), soy sauce, oyster mushrooms, fresh tofu of medium firmness (not silky or dried tofu), cornflower/starch, water, salt and vegetable oil. The oil needs to be heated in a wok (just enough to cover the bottom of the wok) and the garlic, ginger and spring onions should be cooked in the oil for a minute or two. 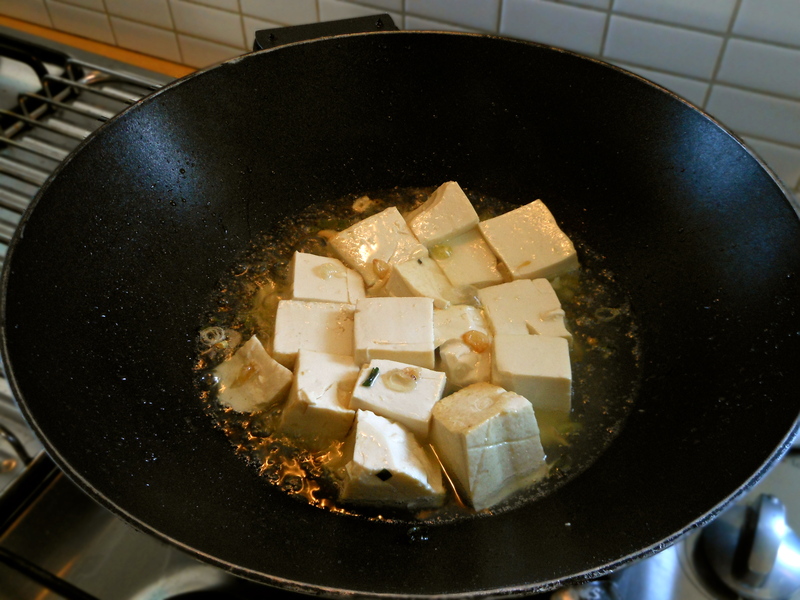 Cook the tofu first, moving it around in the wok regularly. It should start to get softer the more it cooks and as you move it around the wok, it should start to break apart a bit. Once this happens, add in the mushrooms. My mum sometimes takes the tofu out of the wok to cook the mushrooms and then adds the tofu back in later but either way works. Fry the mushrooms for a couple of minutes until they are tender, gradually adding in a bit of water (only a couple of teaspoons) during the process. Lastly, add in salt and soy sauce to taste and then enough cornflour/starch to just slightly thicken the sauce. When cooked right, the tofu should be slightly browned on the outside and melt in your mouth – or if you’re like me, it’ll fall apart when you try to pick them up with chopsticks because you fail at the delicate art of chopstick holding (spoons essential). The first and third dishes are very common in our family’s kitchen and all three are far better options than going down to the local Chinese takeaway shop. Not only are these recipes healthier and tastier but they’re also ridiculously simple to make; the hardest thing about any of these is the prep. Note that these measurements below are rough estimates; how much or how little of these ingredients you put in depends very much on personal preference i.e. whether you want more meat or more veges, how salty or dark you want it, etc. 300g good quality beef steak, sliced into 2-3cm strips. Soy sauce and oyster sauce to taste – NOTE that you can use either light or dark soy; light soy is what we always use and this is saltier than the dark soy but doesn’t colour the food as much. When used in the right amounts, both give the same results in terms of taste; it’s just a matter of whether you want your food coloured darker or lighter. Marinate the beef in some soy sauce and cornflour/starch and leave for a couple of hours before cooking. Heat oil in a wok; the oil should just be enough to cover the bottom of the wok. Make sure the oil does not smoke. Add the ginger, garlic and spring onions and cook for a minute or 2, or until fragrant. Toss in the bok choy and cook for a couple of minutes before adding in the snow peas. Note that the contents of the wok must constantly be stirred and moved around to ensure even cooking. Slowly add in some water but only just enough to keep everything fluid and moving i.e. don’t let the contents become runny. Add in the beef and sear on all sides; don’t overcook. Add soy and oyster sauces to taste. Remember that the darkness of soy sauce is not an indicator of how salty it is – always taste! Through the haze of my jet lag I’m not sure if all of that made sense but there really is nothing to the stir frying. The essential foundations of flavours in Chinese food lie in the “Holy Trinity” of Chinese cooking: ginger, garlic and spring onion. Get these right and it’s incredibly easy to cook a great-tasting Chinese meal. Recipe for tofu and oyster mushrooms coming up next time! 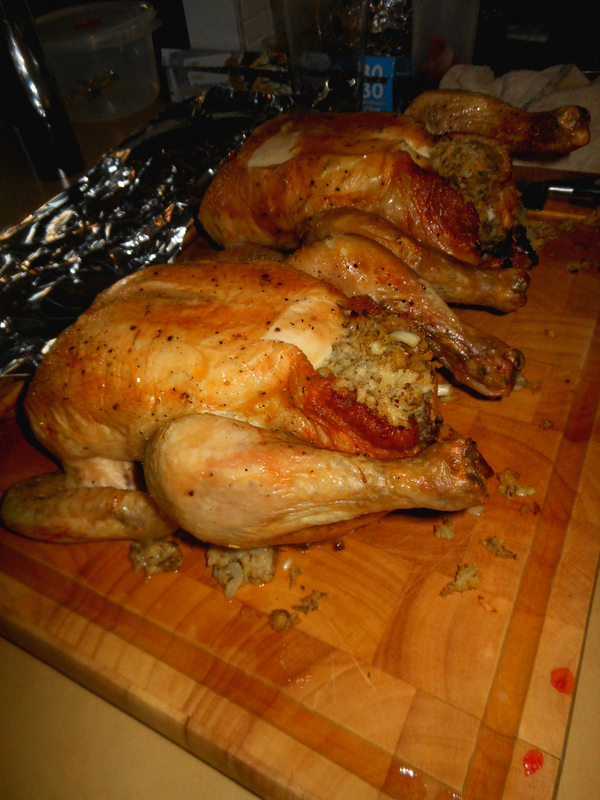 After turning the chickens and covering with foil, they were placed back into the oven and roasted further. They turned out moist and the stuffing was very tasty. I’ve just spent a short part of the afternoon with my hands up the behinds of two chickens, in the process of creating my first roast chickens with herb stuffing. The stuffing consists of bread crumbs of one loaf of bread, 4 finely diced onions, a lot of mixed herbs and salt mixed together with butter. More butter was smeared under the skin (the skin was pulled away from the meat) and on top of the breast meat. The skin was then seasoned with pepper, salt and olive oil. 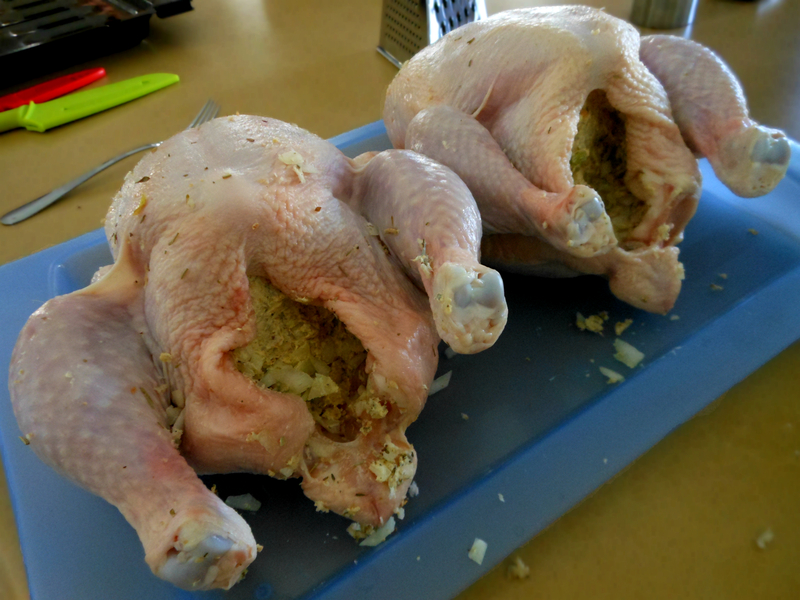 The chickens form the mains of tonight’s birthday dinner – mine and Andrew’s sister in law’s, Shaz – and I’m really looking forward to seeing how these turn out. On Saturday my boyfriend Andrew and I flew to Perth to spend the next 2 weeks with his family. We haven’t done very much since we arrived – the 40°C plus heat being a significant reason – but we have had tasty, hearty home cooking every day since. One of the things that I wanted to learn to cook was Yorkshire Puddings, a favourite of Andrew’s and something that his auntie and mother are very experienced in making (he and his family originate from the North-East of England). 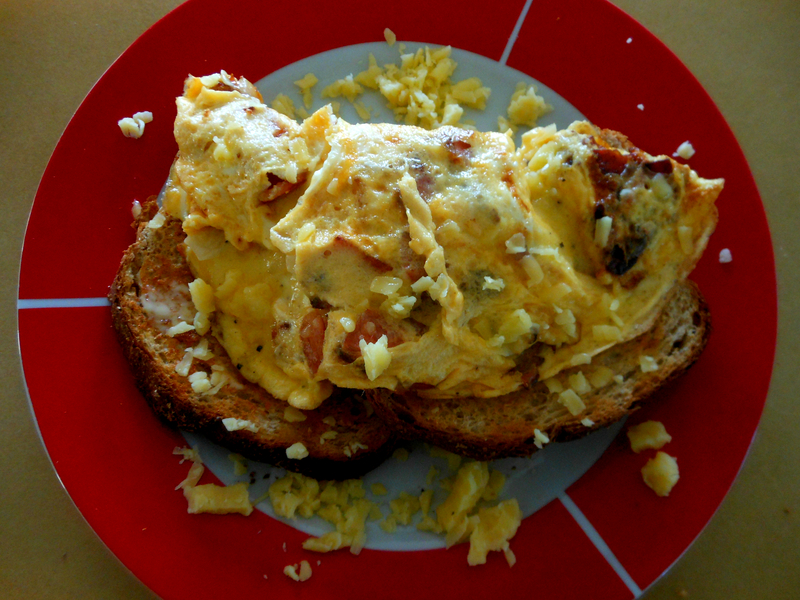 There were no measurements as such, just guesstimates based on lots of years of family practice and experience, but it was basically about 2 cups of flour, a handful of salt, 3 eggs and enough milk to cover the dry ingredients whisked together. The mixture has to be runny so a bit of water was added. It was then refrigerated for a couple of hours. The muffin tray that we used had been prepped about 1 week beforehand with oil (I think it was just smeared with vegetable oil and left for the week). When it was time to cook the puddings, we filled each cup with enough vegetable oil to cover the bottom of the tin and this was put into a 200°C oven until the oil started to smoke (around 10-15 minutes). Once the tray was taken out, each cup was filled about 3/4 full with the pudding mixture. The tray should be placed back into the oven as soon as possible. The puddings were then left to cook for about 20 minutes, or until browned and then flipped over so the bottoms browned up nicely as well. How crispy they are is essentially dependent on the preferences of those eating them but the ones we made were done crispy on the outside and a little chewy on the inside. We served these Yorkshire Puddings with roast turkey breast (itself served with gravy and cranberry jam), cauliflower and broccoli with cheese sauce, peas, carrots and creamy mashed potato.